1 of 1 Heat oven to 400 degrees . 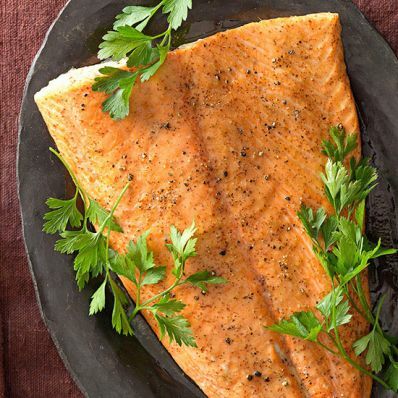 Dry salmon with paper towels and place on an oven-safe baking dish. In a small bowl, combine brown sugar, salt and pepper; pat onto salmon. In a bowl, stir maple syrup, butter and mustard. Pour evenly over salmon. Roast at 400 degrees for 15 minutes or until desired doneness. Garnish with parsley, if using. Per Serving: 7 g carb., 2 g sat. fat, 93 mg chol., 408 mg sodium, 32 g pro., 0 g fiber, 12 g Fat, total, 270 kcal cal.